8 am: Tour guide pick you up from hotel by visiting Ho Chi Minh Mausoleum, is a large memorial in Hanoi. It is located in the center of Ba Dinh Square, which is the place where Vietminh leader Ho Chi Minh read the Declaration of Independence on September 2, 1945, establishing the Democratic Republic of Vietnam. Enjoy the architectural and historical aspects of Uncle Ho’s final resting-palace. Just next door is Ho Chi Minh’s house on stilts where he used to live in the past. Lying to one side of the Mausoleum is the One Pillar Pagoda; built by King Ly Thai To in 1049 the structure has become an important symbol for the people of Hanoi. 9.30 am: Continue to visit Tran Quoc Pagoda as known the oldest pagoda in the city, originally constructed in the sixth century during the reign of Emperor Ly Nam De, thus giving it an age of 1,400 years, then keep walking to Quan Thanh Temple, formerly known as Tran Vu Temple is a Taoist temple in Hanoi, as one of the Four Sacred Temples of the capital, Quan Thanh Temple is located near West Lake. 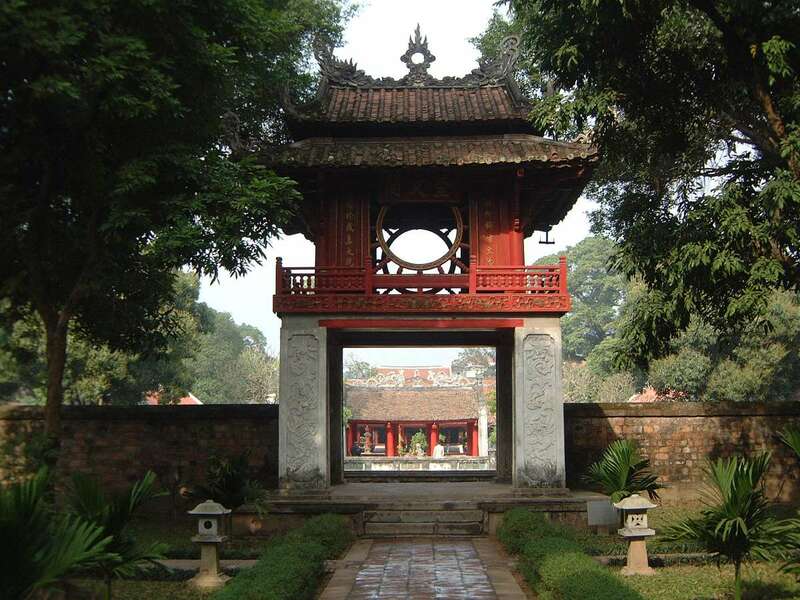 11 am: Keep forward to the Temple Of Literature, constructed in 1070, it is a temple of Confucius in Hanoi, northern Vietnam. And the temple hosts the “Imperial Academy” , Vietnam’s first national university. 12.30: Have lunch at local restaurants. 1.30 p.m: Proceed to visit the Ethnology Museum. Which focuses on the 54 officially recognized ethnic groups in Vietnam, it is widely considered to be the finest modern museum in Vietnam and a tourist attraction in Hanoi. 3.30 pm: We will take you to Hoan Kiem Lake, enjoy Cyclo tour, one of the most typical vehicles in Hanoi, is a human-powered transport with a seat at the front for passengers and the driver at the back. Enjoy an hour cyclo tour around the Old Quarter of Hanoi to experience the bustling, real lifestyle of this exciting and vibrant neighborhood. 4.30 pm: Drop off at your hotel by Cyclo or car. Free time to relax or you can book a ticket for a popular traditional form of entertainment is water puppetry, which is shown for example at the Thang Long Water Puppet Theater. Take hat, raincoat, good shoes and cash. Tour price: $75 US per person for group of 2 people. You could buy a package city tour and just simply pay $50 US to hire me as a tour guide for city tour within 8 hours working.